Peak 10514/Ebony Peak is located northeast of Washington Peak and west of Peak 10408/Ivory Peak. 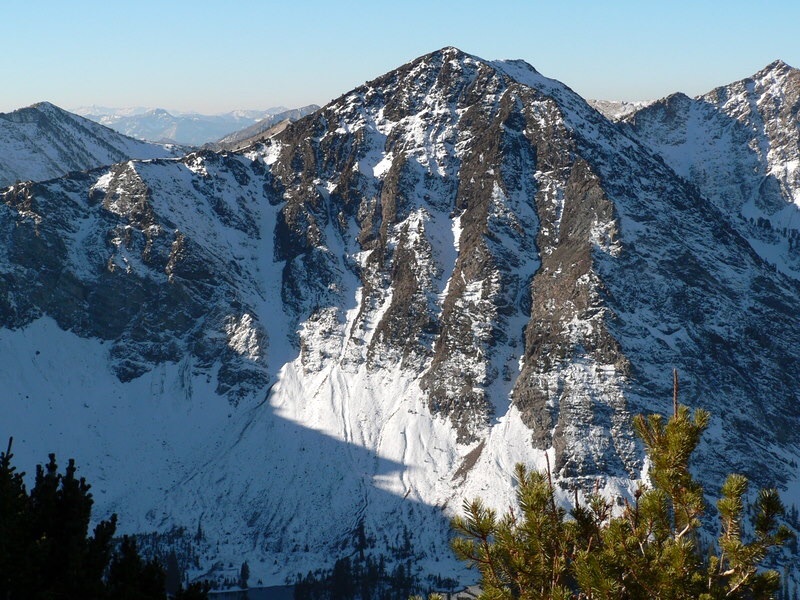 Ebony Peak is usually climbed via a traverse from Peak 10743/Fourth of July Peak and Ivory Peak. Access Fourth of July peak via (A)(2)(a), page 229. Livingston Douglas has provided great route information below that will help you reach and return from this summit. I climbed this route on 9/3/16 via the Fourth of July traverse. From the Ivory/Ebony saddle (10,020 feet), scramble west up the easy tundra slope on the climber’s left/south side of the ridge. You will find a goat trail here to help you. In just over 15 minutes, you’ll be on the summit. The summit is at the northeast end of a long summit “plateau.” A rock fin protrudes from the ground and serves as the high point. Continue along the ridge to summit Washington Peak or descend Ebony Peak by reversing the traverse to Fourth of July Peak. Alternatively, try the descent I found. This route provides an alternative descent to reversing the Fourth of July/Ebony ridge traverse. The descent is mostly class 2, but there are a few short sections of class 3 in the northwest couloir. The rock quality on the north ridge and northwest shoulder is good. However, the rock quality in the northwest couloir is poor. Thankfully, there is no serious exposure on this route. This descent route will take you back to the Fourth of July Trailhead. 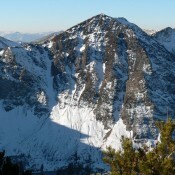 From the summit of Ebony Peak, descend the class 2 north ridge briefly to approximately 10,200 feet. Here, the ridge forks into a northwest ridge and a north ridge. However, neither of those ridges are good options, as the difficulty level increases significantly as does the exposure. Instead, exit the north ridge here and descend an obvious couloir that drops northwest and aims directly at the south end of a small lake (at 9,180 feet). You can readily see this couloir on the Washington Peak quadrangle. Your hiking objective is to aim for the shoulder at the base of the northwest ridge on the east side of this small lake. Descend the somewhat steep couloir carefully, as it has loose scree/gravel in it. This couloir is the crux of your descent. Further down, the couloir becomes too steep and slippery, so leave it around the 9,500-9,600-foot area, exiting right/north onto the face. You will find yourself on a wonderful shoulder/ridge that brings you down to the 9,400-foot contour on a forested shoulder that is located due east of the small lake. The hard work is done. At his point descend east-northeast to an old mining road, which you can see from the shoulder. Stay to the right of the imposing cliffs above the mine. This descent is mostly on angled talus, so be careful. Soon find yourself on the old mining road. Follow the road as it switchbacks leftward to the old mine and then rightward after it reaches the mine. Continue to follow the road as it drops below treeline and passes a nice old cabin on the left side of the road. The road is a little difficult to follow through the forest, but stick with it and you’ll soon be on the main jeep road that takes you north and back to the Fourth of July trailhead. Ignore the side road on the right that leads up to Phyllis Lake; just keep heading north. The Washington Peak quadrangle correctly shows the position of the jeep road, but it doesn’t show the merger with the main jeep road nor does it show the spur road that heads up to Phyllis Lake.